If brunch were an Olympic sport, the city of New Orleans would have the biggest competing team. We take our brunch game very seriously, and that means sophisticated menus with various drink options, preferably in bottomless form. See our list of where to toast the morning, below. 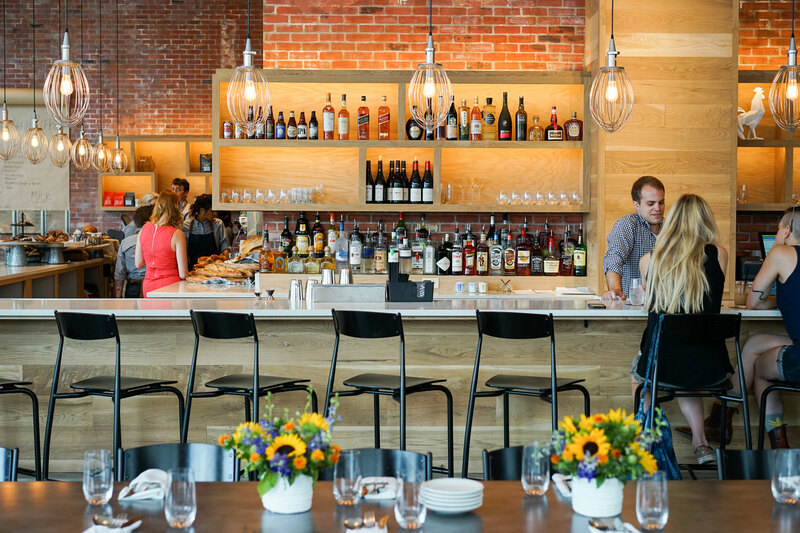 Compere Lapin — Chef Nina Compton’s sleek yet cozy spot in the Old No. 77 Hotel & Chandlery beckons for brunch with options like coconut French toast with pecan-rum sauce or truffle fonduta and poached egg on ciabatta. So you’ll definitely need to wash things down with, say, the “Dealer’s Choice Bottomless Brunch Punch,” right? Or maybe the “Americano? ?” with cold brew, Campari, and sweet vermouth. Brunch hours: Saturday & Sunday 10:30 a.m. – 2 p.m.
Cane and Table — This rum-centric bar and restaurant offers inventive tiki cocktails and Caribbean-inspired cuisine. Bottomless brunch includes your choice of five cocktails, including mimosas and C&T’s version of a michelada, and one entrée for $28. I loved the stuffed vegetarian poblano and the rice calas, or rice beignets, for dessert. But keep in mind that bottomless drinks are only offered as a 2-hour deal from the moment you order. So if you arrive at noon, prepare to give up the unlimited drinks by 2 p.m. Brunch hours: Saturday & Sunday noon – 3 p.m. 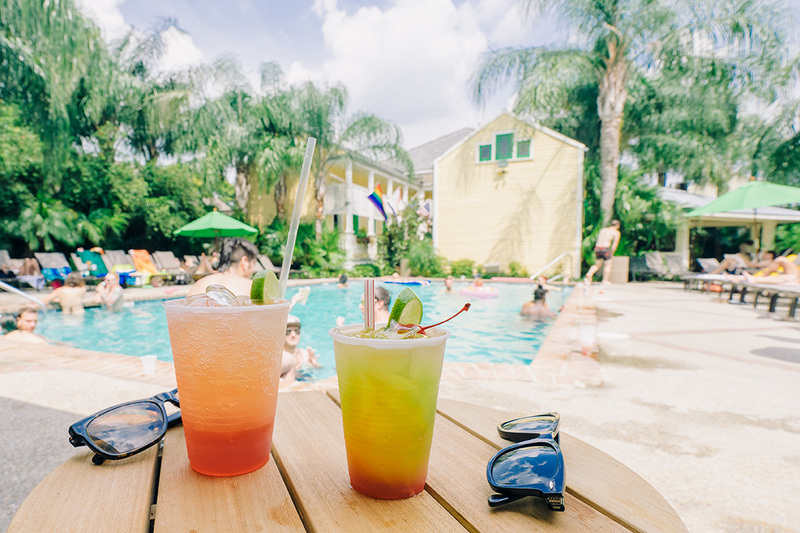 The Country Club – On Louisa Street in the Bywater lives this beautiful Italianate cottage that offers poolside lounging, a sauna, Jacuzzi, cabana bar and delicious food and drinks. Gather a group of friends to indulge in menu items like Chicken and Waffles and Fried Green Tomato Benedict as well as $10 bottomless mimosas. The always-popular drag brunches are now held twice each month on the first Saturday and third Sunday beginning at 10 a.m. Brunch Hours: Saturday & Sunday from 10:00 a.m. – 3:00 p.m.
Broussard’s — Located on Conti Street, Broussard’s Restaurant is known for its beautiful courtyard, fine dining and happy hour specials. But did you know they also offer a bottomless brunch? Endless carafes of orange juice and bottles of cava are all yours for $12 per person. Pair the booze with fried oysters Rockefeller, eggs Sardou on a toasted croissant or barbecue shrimp and grits with Worchestershire butter. Brunch hours: Friday-Sunday 10:30 a.m. – 2:30 p.m.
Apolline – This renovated double shotgun cottage on Magazine Street is equipped with its own kitchen garden and features dishes like Eggs Apolline — a Belgian waffle topped with Andouille sausage, crawfish, poached eggs and hollandaise sauce. Enjoy bottomless mimosas for $14 or Deluxe Bloody Marys with two shots of vodka, house mix, boiled shrimp, spicy beans, cherry tomatoes, celery, lemon and lime for $12. Brunch Hours: Saturday & Sunday from 10:00 a.m. – 2:00 p.m.
Cavan — Kick off the weekend a little early with Friday brunch at regal, ravishing Cavan on Magazine Street (brunch also served Saturday and Sunday). The fried oyster toast with kimchee and ginger remoulade pairs nicely with the “Specialano Spritz,” a refreshing mix of cappelletti, sparkling wine, and soda. There are eight other brunch cocktails on the menu, too, from espresso-laced bourbon milk punch to the “Shipyard Crane” with black tea vodka, peach, and lemon. 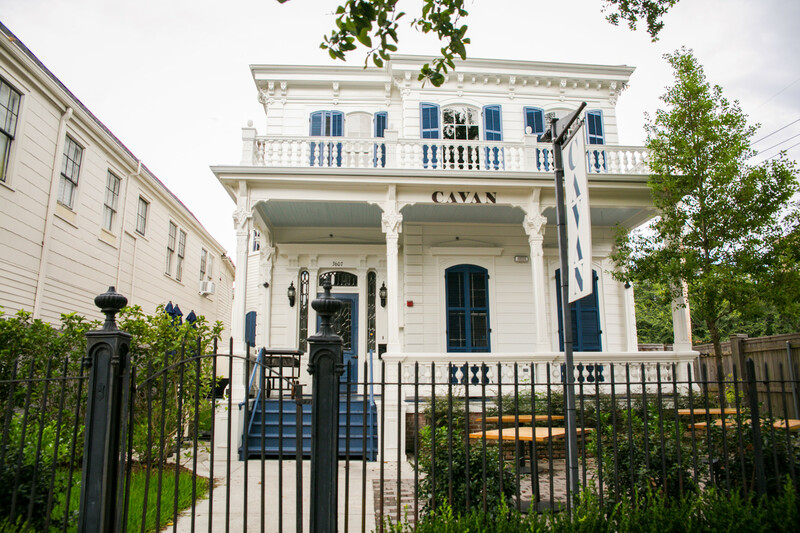 Brunch Hours: Friday-Sunday from 10:30 a.m. until 3:30 p.m.
Sylvain — Housed in a three-story carriage house built in 1796, this popular French Quarter restaurant is full of history, mystery and delicious food. Try the patty melt with cheddar and onion marmalade on seeded rye, crispy blackened pea cakes with kale salad and warm mushroom vinaigrette or warm brioche French toast with seasonal fruit compote. Popular cocktails include the Orange Lazarus with aperol, orange juice, St. Germain and gin for $9 and their house-made bloody mary, served “Milwaukee-style” with a small glass of Shlitz on the side as an ode to the owner’s grandfather, who worked for Shlitz for more than 40 years. Brunch hours: Friday 10:30 a.m. – 2:30 p.m.
Katie’s – You’ll be treated like family at this Mid-City eatery, serving up the goods since 1984. Try their famous veal grillades and grits or lemon-ricotta pancakes and wash it all down with bottomless mimosas, Bloody Marys or Sangria for $15. Katie’s also has brandy milk punch, Irish coffees, Pimm’s cups and other delicious cocktails to fit your fancy. Brunch Hours: Sunday only from 9:00 a.m. – 3:00 p.m.
Stanley — Rise and shine with Stanley’s Morning Glory, a creamy blend of almond milk and espresso vodka. This scenic spot near Jackson Square serves breakfast favorites all day, along with all the brunch-approved cocktails you could ask for: Brandy Milk Punch, Irish coffee milkshakes, mimosas, and Bloody Marys, to name a few. Soak up the extra booze with a classic Eggs Benedict or their iconic Bananas Foster French Toast. Breakfast served all day, 7 a.m. – 7 p.m.
Brennan’s — With a new chef and updated, more affordable menu, this classic New Orleans restaurant is making a comeback in a big way. Sip on all your favorite cocktails, like their spicy Cajun bloody mary with pickled okra or Temperance Tea made with Tito’s vodka, blueberry and black tea infused syrup and honey liqueur for $9. Amid a menu of classic dishes, like eggs Benedict, there are some unusual additions, like the wonderful egg yolk carpaccio with Andouille vinaigrette and crispy sweet potato. And don’t forget the famous bananas Foster, flambéed right at the table. Breakfast/Lunch Hours: Tuesday – Sunday 8 a.m. – 2 p.m. Closed Mondays. Elizabeth’s – This quirky Bywater joint is known for its big portions and Dr. Bob artwork covered walls. Sip on house-made cocktails like Bloody Marys, “Ghetto Fabulous” Mimosas, or their “Corpse Reviver” made from Gin, Cointreau, Lillet, Lemon Juice, and a Herbsaint rinse. Make your own mimosas by purchasing your choice of three bottles of bubbly ranging from $21-$37. Daily specials like Softshell Crab with Creole Sauce, Grits and Poached Eggs are sure to hit the spot. Brunch Hours: Saturday & Sunday from 8:00 a.m. – 2:30 p.m.
Willa Jean — With a breakfast/brunch menu that includes “Mornin’ Snacks,” “Mornin’ Plates,” and “The Biscuit Situation,” Willa Jean boasts plenty on the food side to keep you satiated. But what to drink? Enter the Creamsicle slushie with vodka or the “frosé” frozen rosé slushie (plus other cocktail choices and a full list of coffee and espresso drinks). Breakfast served 7-10:30 a.m. Monday through Friday; brunch available 7 a.m. – 4 p.m. Saturday & Sunday. Atchafalaya – A favorite Uptown brunch spot for live music, great food and a build your own Bloody Mary bar with more fixin’s than you can even fit in your glass. 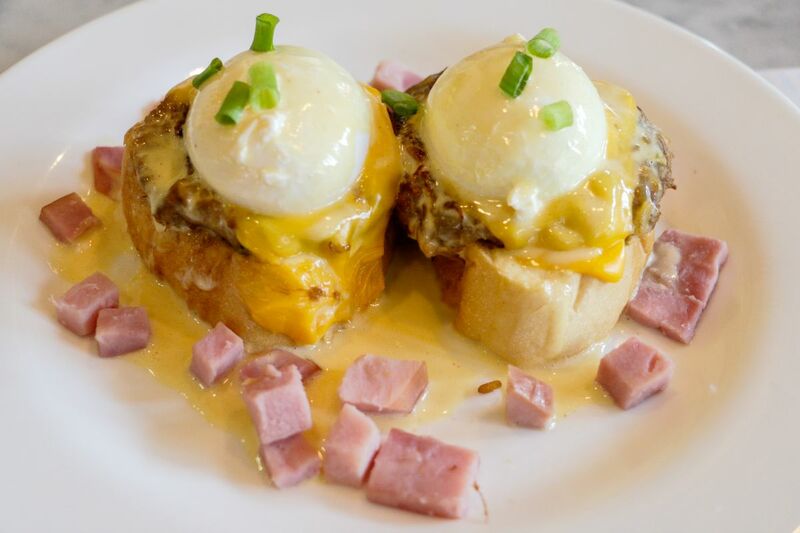 Indulge in the popular “Boudreaux” breakfast of two sunny-side up eggs, alligator sausage, jalapeno cornbread, Crystal potatoes and Creole Hollandaise. And Atchafalaya is one of the only places open for brunch during the week! Brunch Hours: Monday, Thursday & Friday from 11 a.m. – 2:30 p.m.; Saturday & Sunday from 10 a.m. – 2:30 p.m.
High Hat — Freret Street’s popular neighborhood restaurant for Mississippi/Delta inspired cuisine like fried catfish and burgers smothered in pimento cheese also offers quite the deal when it comes to brunch. Choose from 4 entrees for just $11, which also comes with two eggs, any-style. Entree options include roasted pork with creamy grits and poblano sauce and cornmeal fried chicken and waffles served with Steen’s cane syrup. A long list of craft cocktails will inspire you to sit and sip for hours. Brunch Hours: Saturday & Sunday 11:30 a.m. – 4 p.m.
Coquette — At this Garden District restaurant on the corner of Magazine Street and Washington Avenue, chefs Michael Stoltzfus and Kristen Essig create artful dishes prepared with local ingredients. The three-course brunch menu for $25 is a great way to sample this award-winning chef’s creations without breaking the bank. The menu changes every day but you can expect to see fancied-up versions of familiar items, like shrimp and grits with smoked peanut and Brussels sprouts. Glasses of house punch are available for $8. 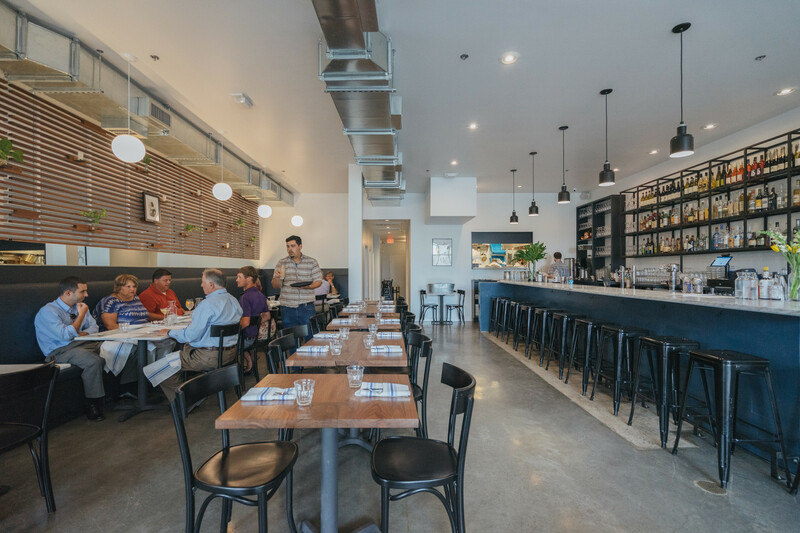 Brunch Hours: Saturday 11:30 a.m.-2:30 p.m. and Sunday 10:30 a.m.-2 p.m.
Basin — As the sister restaurant to Baru Bistro on Magazine Street, Basin is chef Edgar Caro’s modern approach to Louisiana-style seafood dishes. Enjoy bottomless mimosas for $13.99 while sharing warm crab and crawfish beignets with remoulade, or try the crispy pulled pork with cheddar hash browns and green onion sausage gravy. And if you love a spicy bloody mary, Basin’s version is right on point. 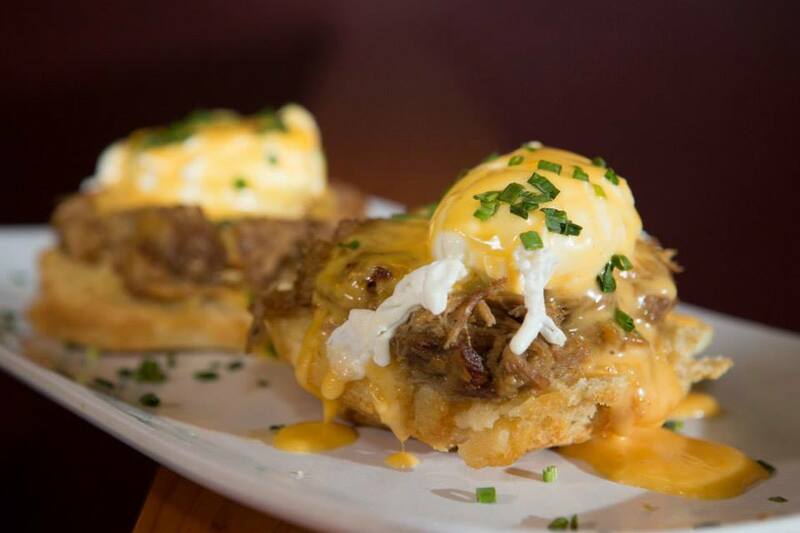 Brunch Hours: Saturday & Sunday 11 a.m. – 3 p.m.
Ruby Slipper – With four locations and a brunch menu that’s served all day, it’s no wonder that this ode to the famous quote “There’s no place like home,” is one of New Orleans’ favorite places to dine. Order up some Croque Madame, Bananas Foster Pain Perdu, or Eggs Coubion with thin-fried catfish, French bread, eggs, artichokes, spinach and tasso, finished with a Creole tomato courtbouillon sauce. Double mimosas and bellinis for $10 and Bloody Marys and brandy milk punch for $6. Brunch Hours: Saturday 8:00. a.m.-2:00 p.m. and Sunday 8:00 a.m.-3:00 p.m.
Horn’s – Owners of the popular breakfast joint Slim Goodies on Magazine Street have managed to create yet another awesome breakfast spot – this time in the Marigny. The menu features popular Slim Goodies dishes, like the Guatemalan with black beans, eggs, avocado, sour cream, salsa, fried plantains and warm tortillas. The sweet potato waffle with spicy chicken wings is a Horn’s exclusive, as well as a Tequila Sunrise, the house special cocktail made with homemade grenadine. Breakfast/Brunch Hours: 6:00 a.m. – 3:00 p.m. daily. Dante’s Kitchen — One simply cannot discuss New Orleans brunch without the mention of Dante’s Kitchen in the Riverbend. 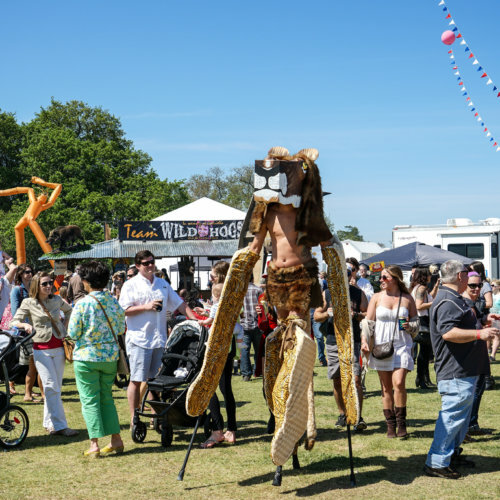 Their brunch has people happily lining up outside in anticipation of chowing down on bread pudding French toast, shrimp and grits with Andouille red-eye gravy, or the crab and brie omelette. Mimosas, bloody marys and a long list of original cocktails are sure to heighten the Dante’s experience. Brunch Hours: Saturday & Sunday 10:30 a.m. – 2 p.m., on a first-come, first-served basis.